"Life Ticks On" 2017 Heart Walk team. Great family and friends who came out to support the cause and have a little fun! Wow!! My heart is over joyed with all the support for the 2017 Heart Walk. It began last year as a team of three and blossomed to a group of 12. I can not say THANK YOU enough for all the support this year. Together we raised over $1300 dollars when our goal was just $500. Don't worry if you didn't have time to donate here is the link to our team "LIFE TICKS ON"
My passion in life is to make sure that no person, family or friend has to suffer from a heart attack or stroke! Together with the funds raised, we can advance research to someday put an end to the #1 killer in America. If you know of somebody or you yourself have been impacted and diagnosed with a heart attack, stroke, atrial fibrillation, aortic dissection or systolic heart failure/cardiomyopathy between the ages of 21 and before 50 please visit this page My Research Legacy. By signing up you are being a vital part of ending heart disease and stroke! Here is a video from "LIFE TICKS ON".. Enjoy!! And a big THANK YOU to Krystal Walker my cousin who was my partner in crime in coming up with a team name, raising money and supporting this crazy journey every step of the way!! The video above is from My Research Legacy. This is a study that I will be participating in as one of eleven inaugural patients with the goal of getting 1,000's involved this first year. . I am so excited to be a part of this pilot study so that I can share my health data and hopefully in the future prevent others from having to go on this journey. Today is Valentine's Day. A day that is marked with hearts and love. It's so fitting that today is the day that the American Heart Association launched my story about being a heart attack survivor. In this video, I share with you the reasons why I want to be part of My Research Legacy! It is so important to me that my passion for helping others who have suffered from a heart attack or other conditions or who have family members know that they are not alone. But they are all a part of this crazy journey called recovery and survival. My Research Legacy is a pilot study that is taking your health data with the hope of saving other people's lives. You can join to If you are 21 to 49 years of age, of any race or ethnicity or gender, and have been diagnosed with a heart attack, stroke, atrial fibrillation, aortic dissection or systolic heart failure/cardiomyopathy, and you live in the United States and have access to a computer with an internet connection and a smartphone, then you are eligible for our Pilot Study. The picture above is from the American Heart Associations general session in New Orleans 2016 where My Research Legacy was launched. The hope is to have 1,000's of patients enrolled to share data and find answers to the causes of these devastating conditions. Thank you for taking the time to watch my video and understand my passion for preventing heart disease, stroke, atrial fibrillation, aortic dissection, or systolic heart failure/ cardiomyopathy. If you are reading this and qualify, PLEASE I beg you go to the link and sign up. It only takes one person to change the lives of many. We are the future and hold the keys to changing what is the #1 killer in the United States. No longer can we accept this statistic.. we need to change it. So I encourage each and every one of you to take some time and look around ask yourself, "Do I have a family member, friend, or loved one who fits the criteria?" "Is it me?" If you answered yes, call, text, email or post a note and get them involved in my research legacy!!! Please feel free to send me any questions you might have. February.. no longer just a page on the calendar! February is not only the month of my heart attack but coincidentally is also known as Heart Month! 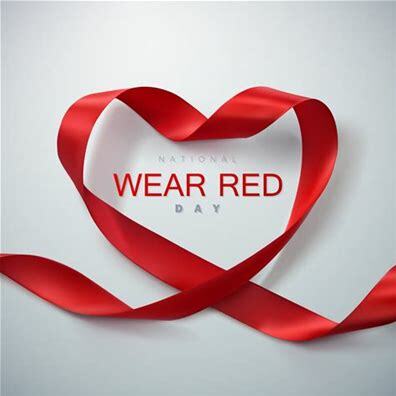 Feb 3rd is National Wear Red Day, Cardiovascular Heart Disease Week is Feb 7-14, Heart Failure Awareness Week is Feb 12-18th, and Heart Valve Awareness Day is Feb. 22nd. If you're going to have a heart attack why not have it in February? One thing you'll find when reading my blogs is humor is a big part of my personal healing journey! This blog is very important to me because heart health doesn't just matter to me but it matters to all of us! Maybe you haven't been affected by heart disease in your family or maybe you know too many people to count. Where ever you fall at on this spectrum it's very important that you and your loved ones know the signs and what steps to take to minimize your risks. Up until 2-10-16 I thought I was the pillar of health .. well was I proven wrong with the sensation of chest and jaw pain. Heart Health not just affects you but your family and friends. Although our heart is ours it's interconnected between family, loved ones, and friends. Take a personal assessment of your health. Ask yourself do you have high cholesterol? High blood pressure? Family history of heart disease? Smoke? If you find yourself answering yes to these questions.. go talk to your doctor. Start your new path to a healthy heart this February and don't look back. We owe this to our loved ones. 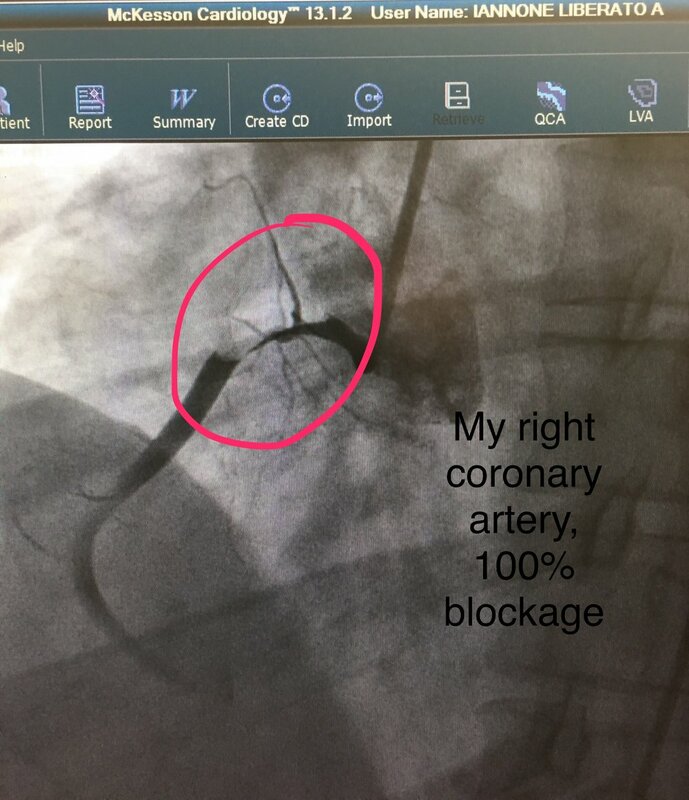 Below is a picture of my angiogram when they fixed my right coronary artery with the placement of stents.. this is why February is so important. February brought about the research and medical developments to open my artery and save my life!! The white arrow points to the stent placed in my artery. This will allow my artery to stay open and bring blood to my heart. The finished product, blood flow restored to my heart!! Noticed the increased blood pathways from this photo to the first photo. During February, take in all the news, stories and information about Heart Health. Wear the color RED on February 3rd and stand united that we can change heart health and move cardiovascular disease out of the #1 spot for mortality.